November 26, 2010 (San Diego’s East County)—One of East County’s best-kept secrets is the cornucopia of unique shops and stores in our mountain towns. From downtown Ramona to the sleepy hamlets of Wynola and Santa Ysabel, to historic Julian and rustic Alpine, you’ll find a wealth of treasures for those on your holiday gift list—including many hand-made items unique to our region. From I-8, exist Highway 79 north past Lakeside. Your leisurely day of shopping and sightseeing will take you through Ramona, Santa Ysabel, Ramona, and Julian. From Julian, continue on 79 past Lake Cuyamaca, then take I-8 west to Alpine, then west back toward San Diego to complete your day of backcountry shopping. It's best to go on a weekend, as not all shops are open weekdays. 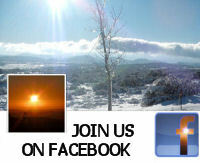 Check weather before heading out for the day, as Julian can get snow in the winter months. Better yet, make it a weekend excursion! Stay over a night at one of Julian’s bed and breakfast inns (such as Julian Meadow View Inn, Orchard Hill, the historic Julian Hotel, or Pine Hills Lodge)Savor fine dining at Jeremy’s on the Hill restaurant (4354 Highway 78 in Wynola) or casual fare at numerous eateries in downtown Julian. Also be sure to visit Julian Apple Pie or Mom’s Apple Pie to savor the flavors that made East County’s mountain region famous for its apple delights. WILDFIRE GLASS DESIGNS, RAMONA: This delightful shop features beautiful fused glass creations hand-blown by a local artist. Options include spectacular glass pendant necklaces and earrings including many for $20 or less, as well as novelty items such as colorful glass wine stoppers. Located in the Kalaidescope Kiosk, 865 Main Street, Ramona. 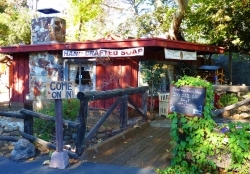 DUDLEY’S BAKERY, SANTA YSABEL: Voted San Diego’s best bakery in a Union-Tribune 2010 reader’s poll, Dudley’s has been a favorite stop for backcountry travelers for many years. Founded in 1963, the bakery is located at the junction of state routes 78 and 79. Besides cooking up delicious breads and pastries, Dudley’s has a gift shop with hand-made artisan jewelry and crafts. Our favorite find: Dudley’s now offers a “Bread of the Month” club featuring two dozen yummy seasonal breads (two per month) for $16.95 a month. Examples include Julian apple nut bread (February) Irish soda bread (March), German black bread (October), and Louisiana pecan maple bread (December). Feast your eyes on more options at www.dudleysbakery.com. WYNOLA JUNCTION ANTIQUES & COLLECTIBLES: This 4,000 square-foot antique mall located in an old apple-packing shed featuring more than 30 antique dealers is a perfect place to shop for memorabilia from yesteryear including quilts, furniture, enamelware, vintage glass and more. There’s also a garden shop and nursery where you can pick up everything from yard art to birdhouses—and keep the kids busy panning for gold while you shop. 4326 Highway 78, Wynola. BELLS INDIAN SHOP, JULIAN: You’ll find a delightful array of Native American jewelry, pottery, baskets, and artwork at this shop, tucked half a block off Main Street. 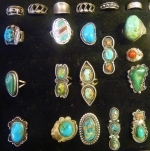 Among the most special offerings are antique Indian jewelry pieces dating from the 1800s; these beautiful silver, turquoise and other fine creations are of a quality you won’t find in most contemporary jewelry stores. 2608 B Street, Julian. THE BIRDWATCHER, JULIAN: This charming store is delight for bird-lovers and outdoor enthusiasts. Find a variety of creative bird feeders, bird houses, bird baths, bird-themed kitchen and household items, bird ornaments, and more. Our favorite find , however, is ideal for all hikers and outdoor enthusiasts: hand-carved walking sticks with built-in compass and wooden whistle! (It’s not shown on the website, but you’ll find many other great items online.) http://www.thebirdwatcher.net/ ; 2775 B Street, Julian. JULIAN CIDER MILL: No trip to Julian is complete without stocking up on Julian cider, jams, jellies, honey and other goodies at the Julian Cider Mill. You’ll also find an array of packaged nuts, dried fruits, syrups, and candies as well as caramel and chocolate-dipped apples. 2103 Main Street, Julian. 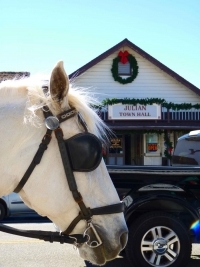 CRAFT FAIR, JULIAN TOWN HALL: Each weekend during the holiday season, you’ll find a craft fair both upstairs and downstairs in Julian’s town hall. During our visit, some of our favorite finds included hand-made quilts, leaf jewelry dipped in precious metals, hand-made wooden toys by Grandma’s Workshop, hand-carved cedar bowls, beaded jewelry, purses, holiday ornaments, and much more. Located at the corner of Main and Washington Streets in the heart of downtown Julian. VIEJAS OUTLET CENTER, ALPINE: Located on the Viejas Indian reservation, the outlet center has discount prices on national name brand items such as leather goods, clothing, shoes, toys, and much more. 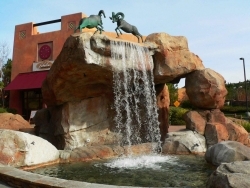 Shopping here is also an experience –meandering through landscaped paths with running streams and a waterfall in a southwest-themed area complete with statues of western wildlife and paw prints embedded in walkways. Iceskating, bowling, an arcade fun zone nd an evening Ice Princess Show make this center a destination of its own. 5005 Willows Road, Alpine (take the Willows Road exit across the freeway to the Outlet center, across the street from the Viejas Casino). Download discount coupons at www.shopviejas.com. JK CORRAL, ALPINE: This rustic-themed shopping area has over 20 shops and restaurants. 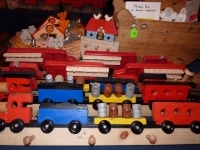 You’ll find unique stores such as L’il Bit of Country, North Star Trading, and the Original San Diego Soap Cellar. Stop off at one of our East County Eater’s favorite eateries, the Vine (great wines, smoothie bar, big menu and cozy ambience complete with fireplace and tree growing through the roof), or order up hearty fare at Janet’s Montana Café (you can’t miss it –just look for the bear on top of the building). 2530 Alpine Blvd., Alpine. I read some of the best product reviews in that shopping center!! And it absolutely looks great, it really makes you wanna shop some more hihi. Especially the women - I guess all this is made for us, because men are really sure and they know exactly what they are looking for. They don't need a second opinion or more time to think. When they walk in the shop they already have picked up the thing they wanna buy. What a great location for shopping. I wonder if I could buy fantasy perfumes for special occasions at one of the many stores presented here. I should mention that the rustic-themed shopping area just takes my breath away.